I was born in Brooklyn, New York in 1965 and enjoyed the first 21 years of my life in the Big Apple. After high school I found myself employed as a NYC Transit Authority railroad track worker. Working the midnight shift building and repairing railroad tracks in filthy subway tunnels may seem uninspiring, but the detail held a certain odd romanticism to me. A since-healed hand injury ended my career there and while subsequently vacationing in Tampa Bay, I decided to permanently relocate. The last quarter century here has been an interesting journey.Having always dabbled in artwork and drawing, I gravitated toward tattooing as a hobby and eventually worked full time in the dermagraphics field. My tattoo handiwork has been featured hundreds of times in various internationally distributed magazines over the course of a decade. In 2002 I responded to an inner urge to expand my art skills and segue into a more traditional outlet: oil painting. Within a year I was selling large paintings at regional events and began generating interest amongst a variety of art collectors ranging from the business elite to NFL stars. I dubbed my style “High-Impact” because of my loud use of color and close-up range of most of my subject matter. My task, my mission, is to expertly render a product that forces an admirer to stop and study the details and nuances of my work. My paintings are rarely glanced at and dismissed and I challenge myself daily by asking, “is this the best you can do?” I currently find myself investing significantly more time refining a painting that even 24 months ago would have been entirely acceptable to me. Being self-taught, the process is humbling, the journey sometimes arduous, and the future nothing short of exciting, knowing that more amazing creations are yet to be manifested. I welcome those interested in custom, one-of-a-kind paintings to personally contact me to discuss your unique vision for a creation you and your loved ones will treasure for generations. The days of messy paint cans are over, paint clean with our patent pending Drip Krown. Fits all 1 gallon paint cans. Happy Mo' says: "No mo' drips! Saves paint!" 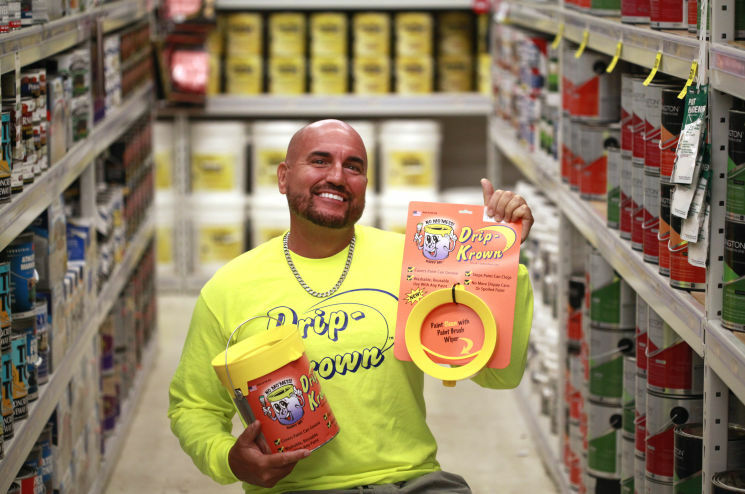 Local St. Pete, Florida painter, turned inventor and Entrepreneur, Don Kobasky, creates the Messy Paint Can Solution. The patent pending Drip Krown is a specially designed plastic device that solves the age-old dilemma of crusty contaminated, drippy, one gallon paint cans. As a lifelong painter, Don was continually frustrated, as all painters are, with the inability to properly reseal a one gallon paint can after use. The accumulated paint in the rim, hampers a proper seal, potentially spoiling the remaining contents. As Don would reopen an old paint can, he often found the remaining contents hardened and spoiled. This frustration led Don to finally prototype and ultimately produce the solution, that anyone who has ever painted with a one gallon can, can appreciate.